I have taken a few spectroscopy images of the white light of a halogen bulb as viewed directly, and through a pair of normal (polarised) brown-tinted sunglasses, and through the EnChroma Cx 15 lenses. I'm severely Red-Green Colour Blind (technically, I have Deuteranomaly https://en.wikipedia.org/wiki/Color_blindness#Types, a genetically transmitted condistion). 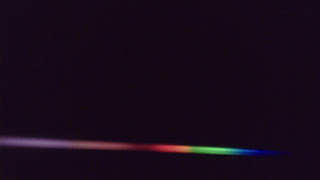 The theory is that for people with normal vision, the Red receptors in the eye respond strongly to red, but only moderately to red-green colours, while the Green receptors respond strongly to green, but only moderately to red-green colours. For people with Red-Green colour blindness (which is my problem), the red and green receptors in the eye overlap in their colour reception, and both respond strongly to similar wavelengths in the red-green range, so they don't differentiate between red and green as well as a normal eye. The EnChroma lenses effectively transmit red and green, but largely block the intermediate red-green colours, so the red receptors will be triggered strongly by red but not by red-green (which are blocked by the lenses), while the green receptors will be triggered by green but not red-green. Where these glasses differ from other products that I have seen advertised before is that these use narrow band-pass "notch" filters to cut out a very tightly defined band of red-green, whereas the more common type use pigmented dye filters, which filter out a wider and less clearly defined band of colours. They're quite dark (just 14% overall light transmission), so they're intended for full daylight use, not really suited for indoor use. If you're wondering - 14% transmission is pretty typical for a sunglass lens designed for full sunlight. E.g. Oakley provide a range of tints from 9% to 11% for "Extremely bright light", while 13% to 22% are rated for "Medium to bright light". EnChroma offers three lens shades: 14% for "strong daylight", 25% for "medium-to-low light outdoor conditions" and brightly-lit indoor use, and 65% for general indoor / computer use. The 14% has the strongest colour-correcting effect, which is why I chose it. In muted light this morning (7:30 am, a bit of light cloud / mist), the effect outdoors was obvious - a lot more contrast and definition between various shades of green and red in the garden. But as the sun broke through - WOW! Some unexpected effects - they can give a strong green cast to some (but not all) digital displays - my Android tablet is now green when it should be white, but my phone looks normal. There's an LED display board outside the Convention Centre which is now green, but as I sit at my computer typing this, the white background is just white. 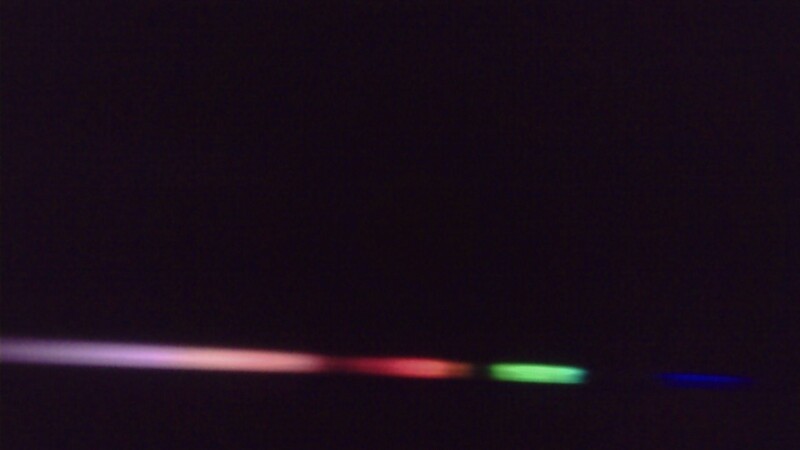 I guess it depends on the exact colour spectrum of the pixels. 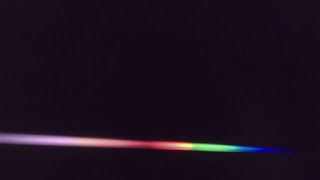 I'll by trying to catch a spectrum tonight using my Public Lab Spectrometer http://publiclab.org/wiki/spectrometer - I'm expecting to pick up a couple of strong "notches" in the white light spectrum. 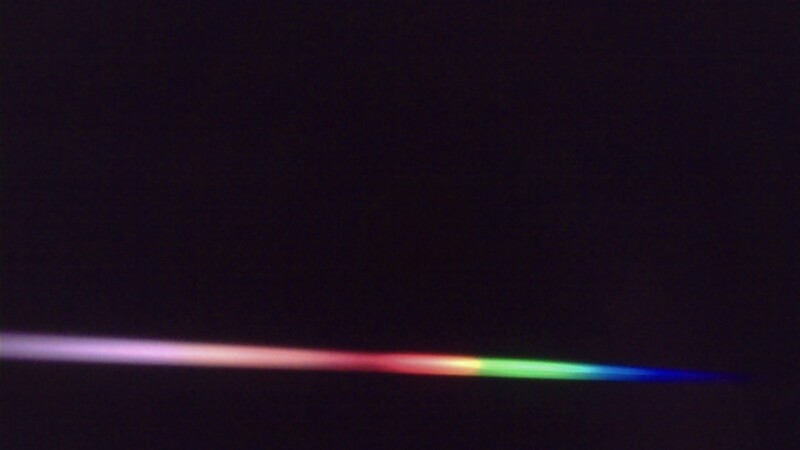 I'll post here when I've captured a useful spectrum. When I started my adventures in the 3D printing world, I was using Alibre Design http://www.alibre.com/ as my main 3D modelling software. While I still have a valid Alibre licence, they have been taken over by 3D Systems (as you will see straight away if you click on the Alibre link above), and the software has morphed into "Geomagic Design", which has different features and licensing terms, and it has been increasingly difficult to migrate my Alibre licences onto new computers, running new operating systems. I thought it was time to look for a new CAD modelling software system to generate designs to feed my 3D printer. on a design team simultaneously work together using a web browser, phone or tablet" - and it seems to be true. 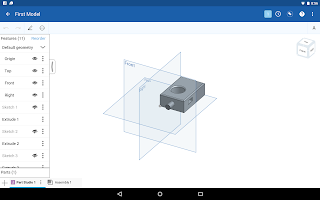 Forget what you might think about Cloud software, and how slow it surely must be - Onshape has a pretty full set of professional modelling tools, and runs really well in a browser on even modest hardware such as a Chromebook, and it has native apps for iPad and Android tablets. Capabilities include a wide range of import / export formats, assembly modelling, and so on. It's missing a few high-end features, but it is still undergoing active development (automatic 2D drawing generation is coming soon, for example). The software designers come from the team that developed SolidWorks, and it shows in the toolset and UI design - if you have previous experience with professional MCAD software, you will feel at home very quickly. Q: Will Onshape ever change or restrict the Free plan? A: Although we cannot guarantee that there will never be additional differences between the Free and Professional plans, we expect that CAD modeling, drawings, and data management capabilities will continue to be fully available under the Free plan. All in all, if you are looking for a good 3D modelling capability, you HAVE to take a look at Onshape! FreeCAD is a totally free, open-source 3D parametric modeller. It seems to be the best-developed open-source 3D MCAD modelling software I have come across, and it is still being actively developed and supported. As such, it has a large user community, and it is likely to be around for a long time to meet your needs. It is available on Windows, Linux and Mac, so will work for most PC users (but no Chromebook or mobile app as yet). It's part-modelling capabilities arr pretty comprehensive (certainly adequate for my needs), and being open-source (with support for Python scripting), it has plug-ins / add-ons / extensions for a range of other software systems, such as Assemblies, 2D drawings, rendering, BIM / IFC, etc. In all honesty, I would have been perfectly happy with FreeCAD if it wasn't for the fact that it needs to be "installed" on Windows computers, which my work will not permit. I was looking for something that I could access occasionally at work, which is how I came across the cloud-based browser-accessible Onshape. 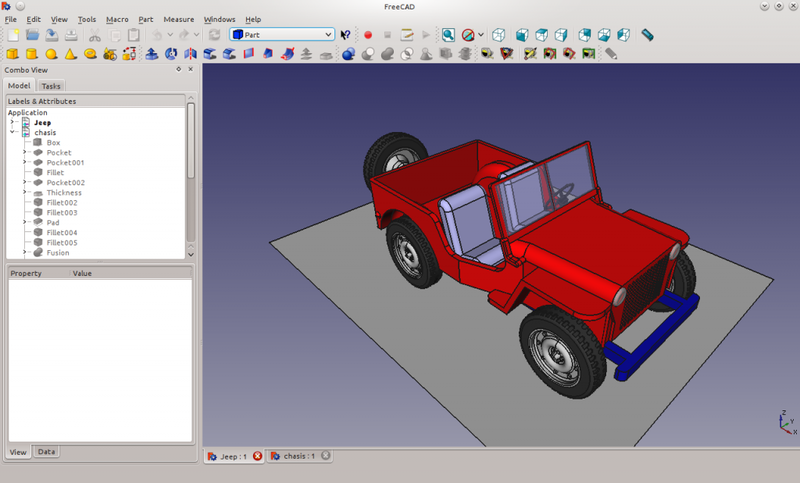 However, if you're looking for 100% free, open-source 3D MCAD software, FreeCAD seems to be the pick of the bunch for now. 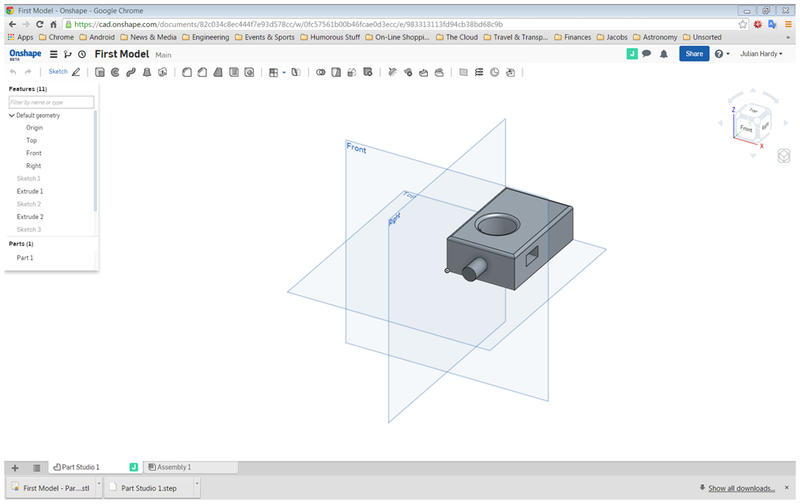 The AutoDesk brand should need no introduction, but Fusion 360 might not be familiar to you. Basically, Fusion 360 is a professional-quality cloud-based 3D CAD/CAM tool, which supports both Mechanical and Free-form modelling. If you're familiar with Inventor, then you will understand Fusion 360. While it is a cloud-based service, it does require an application to be installed on your PC (Windows and Mac are supported) - it does NOT run in the browser, so other platforms (Linux, Chromebook, mobile, etc) are nor currently available options. As well as the traditional free 3-year Student licence, AutoDesk offers http://www.autodesk.com/products/fusion-360/try-buy a free 1-year "start-up license" for "hobbyists, enthusiasts, makers, and emerging businesses that make less than US$100,000 in revenue per year". At the end of the 1-year term, you can reselect the start-up entitlement as often as you want (and as long as AutoDesk continues to support this licensing model). If you are familiar with AutoDesk products (especially Inventor), and especially if you want 100% compatibility with an AutoDesk work environment for example, then Fusion 360 is well worth a look. If you don't have a history with Inventor and other AutoDesk products, you might find it a bit more than you need, but then you only need to learn how to use those parts of its comprehensive tool-set that interest you. Going with an AutoDesk product has the advantage that there is a huge global Inventor user-base, and you can pick up any number of "How To" books from your local book-store (most of which should also apply to Fusion 360), so getting training and support is a no-brainer. And since it's free and legal (for now, anyway), why not give it a try if your interest is piqued? Well, for now, it's almost a dead-heat. I really, really like Onshape - it works well, offers ALL of the features I'm interested in, and is truly multi-platform. My only qualifiers are the fact that it is Cloud-based (so won't work without an Internet connection) if that worries you, and the fact that it is proprietary software, and they might change their personal / hobbyist licensing terms one day. (I'll probably keep using it as long as it's free). In my view, Cloud-based software is probably the way of the future, and I have access to an Internet connection almost all of the time. The ability to view / refine models on any device at any time is a real plus (e.g. put the finishing touches on a design using your tablet while you're on the bus home after work). Otherwise, FreeCAD will also stay in my portfolio - partly because it's very good, and partly as a back-up in the event that Onshape is no longer available to me. It does MOST of what I want, but it isn't quite as polished, and it won't run on all of my devices (I can't install it on my work computer or my Chromebook, and I can't access it on my Android tablet, for example). In third place for me is Fusion 360 - but mainly because it's a bit of a sledgehammer to crack a walnut as far as my needs are concerned - but if you have a track record with AutoDesk software generally (and Inventor in particular), you may well want to take a look. For now, I'll give a Points Decision to Onshape - I'll post an update after a few months use to let you know if my feelings have changed.